Put Battlefield 2 + Special Forces Expansion + Euro Force and Armored Fury Booster packs + Highway Tampa + v1.41 Update Patch + Your Profiles Folder + the Mini Image + Your Serials all on the one DVD. Effectively creating your own BF2 Complete Edition DVD. NOTE: Unfortunately this particular installer will only work for the EA Downloaded versions of the Euro Force and Armored Fury Booster packs! It will not work for the Retail DVD version of the Booster Packs. After you finish, the conversion, everything you need to play BF2 will be together on the one convenient DVD. If you include the Mini Image on the DVD you won’t ever need the original Discs, in the CD/DVD drive, to play. No more looking for that disc when wanting to play! You will be able to store the original discs! They won’t be needed to play. If you include an edited version of your ‘Profiles’ folder on the DVD you can reinstall the game but keep your same personal settings, like Video and Controls settings etc. You can also edit these files to remove unwanted clutter. So your install will still be a ‘fresh’ install. After reinstalling you will have a personally configured game with the, Account, Video and Controls settings already configured to just how you like them. 3. Install the v1.41 Update patch. 6. Install the v1.41 Update patch again. 7. Install the Highway Tampa map. The above is the ‘Recommended’ order in which the games and updates need to be installed! The normal install procedure installs the v1.1 update (as part of the SF install) and also has to install the v1.41 patch ‘twice’. So that’s 3 updates you have to install! There is NO need to install the v1.1 update first! When Special Forces is installed my installer will install the v1.41 Update patch instead of the v1.1. This removes the need to install the v1.41 update again after Special Forces is installed. You will still need to install the v1.41 update patch again after installing the 2 Booster Packs. 1) Create a Temporary folder on your hardrive, name this folder: BF2 Complete. Extract the contents of the RAR file to the newly created BF2 Complete folder. Provided with the Menu are all the folders you need for the conversion. My Mini Image is also included in the RAR file. This will enable you to play without needing the original discs in the drive to play. You can view a pic of the Custom Install Menu here. 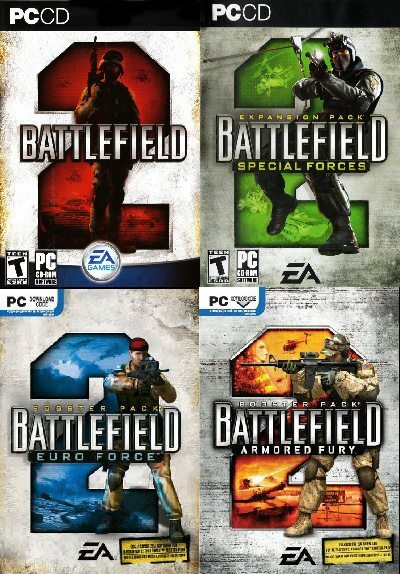 Copy all the contents of your Battlefield 2 DVD to the ‘Battlefield 2’ folder. Copy all the contents from CD1 to the ‘Battlefield 2 folder. From CD2 copy only the ‘data3.cab’ file to the same ‘Battlefield 2’ folder. From CD3 copy only the ‘data4.cab’ file to the same ‘Battlefield 2’ folder. Copy all the contents of your Special Forces DVD to the ‘Special Forces’ folder. Copy all the contents from the Special Forces CD2 to the ‘Special Forces’ folder. 5) When you downloaded the Euro Force Booster pack from EA, it comes as an EXE file. Extract this EXE file to the ‘Euro Force’ folder. 6) When you downloaded the Armored Fury Booster pack from EA, it comes as an EXE file. Extract this EXE file to the ‘Armored Fury’ folder. 8) In the BF2 Complete folder there is a Serial.txt file. Open this text file with Notepad. Replace both the xxxx-xxxx-xxxx-xxxx-xxxx with your own serials and ‘Save’ the changes. 9) Rename your v1.41 Update patch to BF2 Patch.exe and copy it to the Patch folder in the Special Forces folder. This replaces the v1.1 Update patch you deleted from this folder earlier. 10) If you currently have BF2 installed you can copy your ‘Profiles’ folder to the DVD. This will enable you to reinstall the games then swap the Profiles folders to give you back all your personal settings. It will be like the game was never uninstalled! Your Account, Video settings, and your Controls settings will automatically be the same, no need to reconfigure these time consuming and very tedious tasks! But to do this properly, so it will be seen as a fresh install, some changes to these Profile settings need to be done before you copy them to the DVD! Note: I have tried to include as much detail as possible about these changes. We only need to Edit 2 of the files! We will only edit the ‘DemoBookmarks.con’ and the ‘General.con’ files. THIS NEXT BIT IS IMPORTANT!! PLEASE PAY ATTENTION!! Double Click the DemoBookmarks.con file. A little window will open, choose ‘Select the program from a list’ and click OK.
Now the ‘Open With’ window will open, THIS IS WHERE OUR MOST IMPORTANT STEP OCCURS!!! Now choose the Notepad to open the file. NOTE: We just deleted all the battlerecorder reference files. Every game you play is referenced here. There is no point in keeping them as most severs do NOT allow you to download the Battlerecorder files!! Double Click the General.con file. Now we DON’T want to delete all the text here! This is the file which controls all the annoying tutorial nag screens which tell you how to use each kit etc! This happens after a new install of the games, the game presumes you have never played before! This file also lists all the servers you have ever played on! There is no need to have all these servers listed and only slows down the connection time when you start the game! All the text between these 2 lines can be deleted. If it leaves a space between the lines then delete the space! When the DVD is inserted the Menu will auto start. Click the Serial/Readme button to get access to your install serials. Once the system restarts, you need to start the Autorun file again. Eject and reinsert the DVD, or go to My Computer and Right Click the drive and choose Autoplay, or browse to the DVD in Windows and Double Click the ‘CD_Start.exe’ file. When the Menu restarts, Click the ‘Install Special Forces’ button to install Special Forces. (Normally Special Forces would update BF2 to v1.1 before starting the SF install. The way we have done it will now take a little longer to install the first update process but we will save time in the long run as we now only have to do 2 updates and not 3. The first time it installs the v1.41 update takes a little longer than installing the v1.1 update but the update process is a lot quicker when we install the v1.41 update the 2nd time! Once Special Forces finishes installing you can install Euro Force and Armored Fury. When Euro Force and Armored Fury finish installing you will have to install the v1.41 update again. Then you can install the Highway Tampa map. Now Browse to the DVD in Windows. Copy the Profiles folder from the DVD to the correct location. Choose Yes to Overwrite the folders and files when prompted. To Play BF2, Special Forces, Euro Force, Armored Fury or Highway Tampa, without having your original discs in the CD/DVD drive, you will need to mount the Mini Image using either Daemon Tools or Alcohol 120%. This is perfectly safe for online play and won’t get your accounts banned! From the DVD, copy the Mini Images folder to somewhere on your hardrive. I recommend copying it to the same place you installed the game. Once Daemon Tools is installed you will have a Daemon Tools (Lightning Strike) icon in your taskbar. You don’t need anything ticked in the ”Emulation” tab either! Again right click the Daemon Tools icon in the Taskbar and go to ”Virtual CD/DVD Rom”, then to ”Device 0” then to ”Mount Image”. Browse to where you extracted my Mini Image and choose the ”BF2 CD 1_Mini.mds” and click ”OK”. Once you choose OK a Window will open showing you what appears to be all the files on the disc. The files are not really there! A Mini Image only copies the Protection from the original discs! You can Close this window. Now again Right Click the Daemon Tools icon in the taskbar and choose ”Exit”. If you keep the Mini Image permanently mounted you will never have to open Daemon Tools again or change any settings. You can now start Battlefield 2 using your normal BF2 Desktop or Startmenu shortcuts. You will never need to use your original Discs to play online or single player! EXTRA: If you don’t want to sit through the intro video all the time you can edit the startup shortcuts on your desktop. Right Click the Battlefield 2 icon on the Desktop and choose Properties from the bottom of the Menu. Click on the Shortcut tab at the top of the next window. In the ‘Target’ box, go to the end of the line and press the Space Bar and add +restart to the end of the line. You can do exactly the same for the Special Forces Desktop Shortcut. Now when you start the game you will go straight to the Login Screen. Disclaimer: This method will not work for warez”d or pirated versions of the games! An original legally purchased CD Key is still required to play BF2 online! This is only a method to help preserve your original discs. We do NOT support Piracy in anyway! !